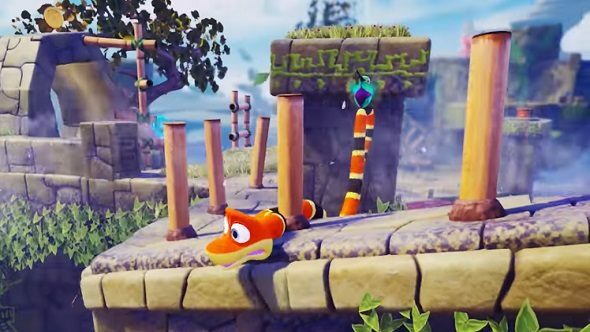 As its March 28 release date slithers into view, Sumo Digital have released a new trailer, showing off the Air Realm area in Snake Pass. Acting as the final elemental zone on Haven Tor, players will have to navigate through blowing gales to get Noodle through safely. If you’re on an indie game kick, check out these other top PC indie games. With a name like the Air Realm, one would expect that this area is known for its windy conditions. In order to get through this area, players will have to show their mastery of coiling themselves round objects at speed to avoid being blown right off the edge. You’ll also have to navigate through updrafts, with Noodle being carried off into the sky by swirling columns of air. His look of pure terror as he flies into the sky is priceless, I have to say. Would-be serpents also need to have control over moving objects while Noodle is constricting them, as you have to extend and shift poles around to continue your climbing. The Air Realm will no doubt act as a sort of final exam for Snake Pass players, proving that they know all the basics before moving them onto the really tricky platforming. There are glimpses of other levels in this short trailer, with what looks like the Fire and Water realms being shown very briefly. The Fire Realm seems to have Noodle navigating over lava pits while the Water Realm has the snake doing his best eel impression. For those who are almost shedding their skin in anticipation, Snake Pass releases on Steam March 28.